When you first look at a drum throne, you see a simple, padded stool. But there’s a lot more to these seats than meets the eye! Seat style –“Tractor” style seats may be more comfortable than round ones, depending on your shape, size, and personal preference. Round seats offer a good level of versatility, so pick whichever one is most comfortable for you. 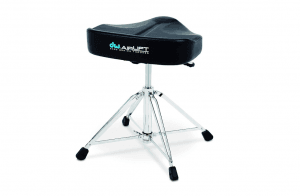 Adjustability –Look for a drum throne with quality components underneath. After all, the base is what ultimately supports you, and you want maximum adjustability to ensure that you can find the most comfortable position possible. Your size and weight–If you’re larger than the average person, you should check weight ratings as may need a heavy-duty drum throne. Tall drummers should double-check maximum seat height to ensure that they won’t be playing in a cramped or crouched position. 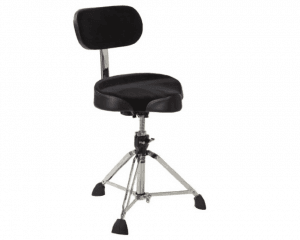 Backrest – Some drummers like backrests while others can’t stand them. This is a completely personal choice. If you like the idea of a back rest but you aren’t sure if it’s for you, consider a model that gives you the option of adding a backrest if you want to. This way, you can enjoy more versatility. With these considerations and a few others in mind, we’ve shortlisted five of the best drum thrones on the market. The DW Drum Workshop heavy-duty airlift drum throne features a tractor style seat with dual foam padding and an ergonomic, pressure-relieving design. With four feet and an easy adjust lever, this drum throne features a folding base and incremental positioning. A compatible backrest is sold separately. Who will appreciate this drum throne? Serious players and students who spend plenty of time drumming are sure to notice a difference with this well-padded drum throne. While it’s definitely not a budget pick, it’s got an excellent reputation. The 5-year warranty covers the moving parts, but won’t help in case the upholstered seat is damaged or excessively worn. With a Cordura and vinyl seat that provides a combination of durability and comfort, the large Gibraltar moto style throne features a solid steel spindle base and double-braced legs atop solid foundation rubber feet. The memory lock height adjustment offers settings between 20 and 28 inches – a bit higher than average. The seat is breathable and features built-in memory foam for enhanced support. The backrest is attached to the seat, so support remains in place as you swivel. Larger players who want a comfortable bike style seat and a backrest are likely to appreciate this drum throne, particularly if they’re not worried about the lack of hydraulics. This throne pairs some premium features with a moderate price. Not only do drummers enjoy it, it’s been favorably reviewed by other musicians including guitarists, ukulele players, and keyboard players. 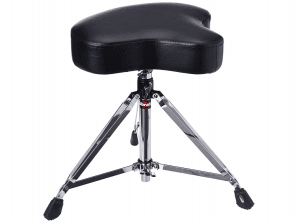 With a comfortable motorcycle-style seat, the Gibraltar 6608 drum throne offers top-grade foam and a durable vinyl exterior. The three-legged base is double braced for added durability and sits atop Gibraltar’s signature Clydesdale-style rubber feet. A memory lock makes for easy height adjustments between 18 and 24 inches. Drummers who are looking for a comfortable, budget-friendly throne will want to shortlist this one. While it’s fairly basic, it’s got better components than some other inexpensive drum thrones, and it gets mostly favorable reviews. While the Gibraltar 6608 may not be the best drum throne on the market, it’s our budget pick thanks to a price tag that’s well under $100. With an ultra-sturdy four-legged, double-braced base and durable rubber feet, the Mapex T770 drum throne offers a pleasing combination of comfort and stability. The round seat measures 14” wide and is 4” thick. Players have the option of swiveling or using the built-in a lock feature. An adjustable back restenhances comfort while providing additional support. 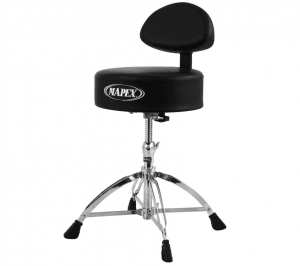 If you prefer a round drum throne, then you’re likely to appreciate this one from Mapex, particularly if you are a larger individual or a highly energetic player who requires more support than average.Mid-range pricing makes this a fairly affordable pick; many reviewers mention that they’re surprised at the level of quality this throne delivers considering the moderate cost. The Roc-N-Soc original saddle drum throne gets great marks for its ergonomic design, which feature a slightly elevated, contoured rear edge that’s designed to promote good posture and prevent fatigue. Double-braced legs impart strengths, and a swivel adjustments makes it easy to find the right height between 18 and 24 inches. 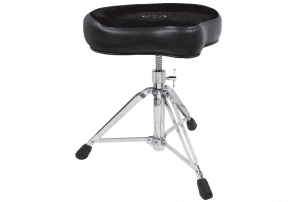 This drum throne has an optional backrest, available in your choice of black or blue. Feels sturdy and stout, but not terribly heavy. Supports larger players well; one reviewer mentioned that it’s suitable for his size of 6’2” and 340 pounds; another mentioned that it works well for his size of 6’5” and 375 pounds. If you’re looking for a good quality drum throne that has a time-honored reputation for durability and longevity, then the Roc-N-Soc original saddle drum throne may be ideal. While it isn’t best for shorter players, it’s got an excellent track record with big and tall players. It’s worth mentioning that this seat isn’t only popular with drummers; it’s also a favorite with guitarists and pianists. If you’ve been drumming for a while, then you already know that no two drum thrones are created equal! Here are just a few more things to keep in mind as you examine your options. Portability: If you plan to travel a lot and you’re low on space, then it’s a good idea to look for a drum throne with a folding base. Weight contributes to portability too. There are quite a few options out there that manage to offer a good combination of comfort and portability, so you don’t have to sacrifice either. Stability: Four-legged drum thrones typically offer better stability than three-legged varieties, although some manufacturers add stability via wider “Clydesdale” style rubber feet. The level of stability required does depend on how active your playing style is, so keep this in mind as you make your choice. Price: Quality drum thrones aren’t exactly cheap. The good news is that a great throne will help keep you comfortable so that you can focus on the rhythm, even when you’re playing for hours at a time. Additionally, a quality throne is likely to last far longer than a cheap one, so you don’t end up spending even more money in the future. While it’s not necessary to purchase the most expensive drum throne on the market, this is a very important piece of equipment. It’s a very good idea to treat yourself to the best one you can afford. We found that thrones averaging $120-$150 were among the most popular with all but the highest-level players. A drum throne is much more than a simple seat. With the right one, you’ll enjoy a good combination of comfort and support, so you can deliver the best performance possible.